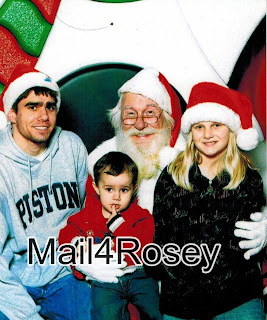 Mail4Rosey: Finally, 'tis the Season (officially)! I thought Black Friday was for Friday only? I have been informed that it runs all weekend long. Whew, I hope the crowds don't. ;) While I didn't venture out yesterday, hubby wants to go out tonight or tomorrow and do a little Christmas shopping. The last year big brother was home. We'll do a Santa stop too. My son's excited about seeing Santa, and the older kids have always been good sports about posing with Santa too. :) The holidays make me miss my grown boys more than I already do. I like them close to their mama. All of our decorations are up except the tree...we still have to get that...probably sometime this weekend. I wanted artificial this year, but we always get real and hubby loves it (I love many things about a real tree too), so that's what we're going to do. I'm not putting the train around the tree this year, maybe that'll make maintenance easier (moving the train tracks daily to get the pine needles is tedious). In any case, I hope we get a really fragrant one...the fresh scent of Pine is my favorite thing about having a real tree in the house. I just popped over from Keith's Optimistic Existentialist blog. I was thinking I could take Isaak with me to drop Mica off for a birthday party, and then go to Gymboree, or Crazy 8 to get him some jeans. He has a lot from Mica, but they have holes in the knees. Black Friday...to love it or hate it. I didn't know what Black Friday was until I went to work for Walmart. I'm glad I don't have to do that anymore and there are many deals to be had but I think I still hate it. My husband swung in and grabbed a deal he had set his mind on before showing up at my mom's for Thanksgiving but I didn't participate in it. I haven't even started my Christmas decorations yet but I've been pondering over it...Sorta' get ready to get ready...I hope you have a great weekend. I've got to go out next week and get toys for our annual yacht club toy drive, but that's about the extend of shopping for us. We quit doing gifts long ago. Takes all the pressure off us and our family. I do love Christmas though. I decorate and the like, and love the Christmas music. It's a magical time of year. I can not go Christmas shopping on Thanksgiving. 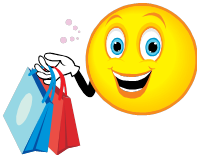 I like to shop on Friday because it is better for me. I got some good deals and I had fun going with my sister on Black Friday! I like you love this time of the year! I like the tree with the lights and all the fun movies and getting to spend time with the family. I am definitely in the Christmas spirit already! I have done most of my shopping. We put up the tree yesterday and played some holiday music! It's fun when the men share a new perk to them right? I see all the sales and realize one day I'd love to be able to take part. Maybe it will happen. For now we give thanks. I don't remember seeing a Santa here. Must be something to do with LA. I heard once that one was at the zoo, but that was it. 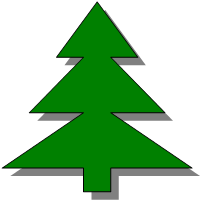 I hope you get a great tree. We have never had a real tree. I think for now I don't mind the fake tree, and especially with kitties, I'm not sure how it's all going to work out. I've got some Christmas spirit, but I still need to drag the tree out, and get it up. Then it will feel like Christmas. Love the santa photo :) My cousins and I took photos together from the time we were little. They still take them as adults with their kids. It's pretty cute and a great way to get in the spirit! If you went shopping this weekend I hope that the crowds weren't too bad! Christmas is definitely near now Rosey! Imagine tomorrow is Decemeber 1. 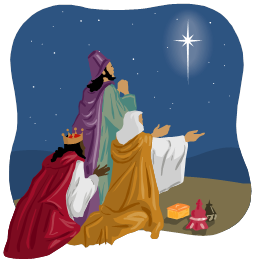 I listened to some carols today. I am getting in the mood for Christmas. I will definitely decorate. Decorations lift my spirit. Enjoy the rest of your weekend and all the best with the shopping. We used to get the tree up early, but now it's usually a little later. Have to get those deals when you can! The boys are definitely in the spirit! Grant actually took them out on Black Friday at like 5 am to go shopping. "Just for the experience." We set up our tree yesterday complete with new train (half price at Toy R Us!) So yeah, we are feeling it! Now, I really need to start my shopping!) Yikes! I actually wrapped some Christmas presents yesterday! That's the first I think I've ever wrapped a gift when it was still technically the month of Nov! Our tree has been up for a week and we still need to do our outside lights. ha. yes, in the spirit....we saw santa on friday at the speedway...was very cool...i am def ready for christmas...nice pic of the kids with santa...smiles. I love Christmas, it is my favorite time of year. I love the lights, the music, the smells, the trees, and the gift giving. Now that Thanksgiving is over, I am officially in the holiday spirit! The car was filled with lovely Christmas Carols (sung by me, so I'm sure my family would insert a word other than *lovely* there lol). Shopping is about wrapped up, so next stop- cookie baking! My Daughter couldn't wait for Thanksgiving to be over so she could start decorating. Now she can just go to town decorating. I agree with you about the real tree...the smell is so worth the mess.. the downside is when I manage to get the only tree on the lot with NO scent... it's happened before! Usually I'm in the spirit but I can't seem to find my holiday cheer this year. I still have so much left to buy and do. Hope you have a wonderful holiday season!